Home built tip-downs are much less expensive than commercial models. Ice fishing is a popular sport around the Great Lakes and other areas of the country that see long, cold winters and thick ice layers. Ice fishing is quite a bit different from normal warm-weather fishing, in that the fish are more lethargic and less likely to strike your bait hard enough to set the hook properly. Thus, you have to let the fish take the bait a bit deeper than in warm weather fishing. Tip-downs allow ice fishermen to set up their rod and bait so they not only know when a fish takes the bait, but can also allow the fish to take the bait deeper without feeling resistance on the line. Home built tip-downs are simple to make, easy to use, and cost a fraction of what commercially manufactured equipment does. Begin by constructing the "rod." Cut a 1-inch dowel rod to 24 inches in length. Use 1 1/4-inch tubing clamps to clamp the prespooled fishing reel to one end of the dowel rod. Screw one 1/4-inch eyelet into the dowel rod directly in front of the reel, then place another eyelet at the opposite end of the dowel rod. Pass the fishing line through these two eyelets to complete the rod. Construct the base from 2-by-4 lumber. Cut a piece to a length of 20 inches, then cut the base into a point so you can punch it into the snow. Next, cut a 2-inch by- 2-inch deep square out of the top of the lumber, then cut notches on either side of this square perpendicular to the 2-inch side of the wood. 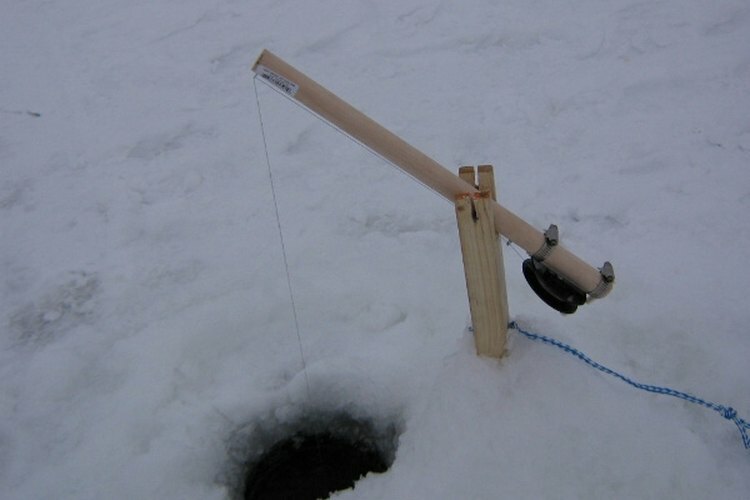 Complete the tip-down by attaching bait to the end of your fishing line and letting the line to a predetermined depth through a hole in the ice. Push the base of the tip-down into the snow approximately 10 inches from the edge of the hole. Hammer two finishing nails 8 inches from the base of the reel on either side of the rod and place the nails into the notches on the 2-by-4 base. The weight of the reel will keep the tip of the tip-down up until a fish takes the bait, at which point the rod will tip down, indicating a hit. You can paint the tip of your rod fluorescent orange to make it easier to see against the snow, and to show you have a hit from greater distances.